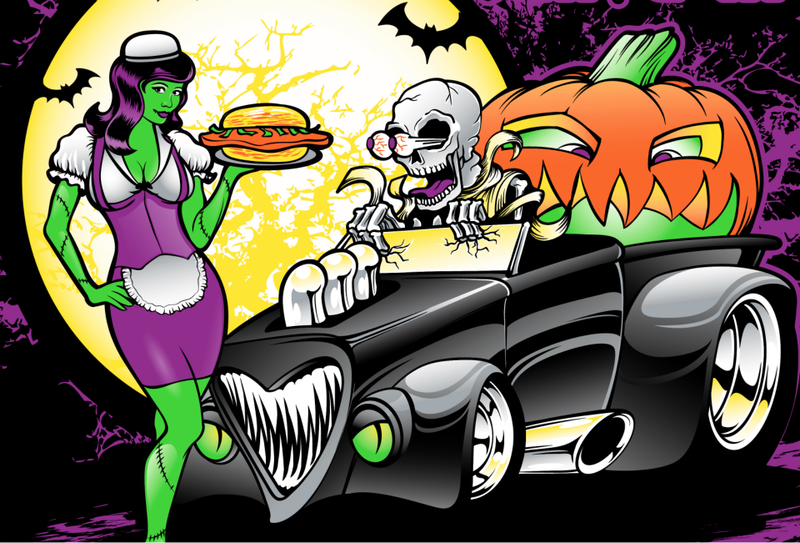 Last year I was contacted by the purveyor of tenderoloiny-sandwich-goodness to create a new car show t-shirt design for the Edward’s Drive-In Spooktacular Car Show. Being quite the hermit, I had to research a bit about these guys, I guess Man vs. Food paid them a visit, and noms were had (and enjoyed) (hungry yet?). They requested a new design for their Halloween-themed car show t-shirts, and wouldn’t you know it, I had just the perfect sketch to go off of – I had scratched this out a few years ago, but never ended up going anywhere with it. I sent that off with some notes about where I’d like to go with it, and my ideas were approved. Let me note that I adore Halloween, and Halloween themed events, and the fact that Disneyland transforms The Haunted Mansion into a paradise of The Nightmare Before Christmas that time of year... yeah I get a bit enthusiastic for Halloween themed artwork.